Summer is upon us! Silly season is firing up and another year has almost gone. That year sure did go fast! Here at Eagle, since 1st of July, we've made 589 updates to the product, which works out to over 5 per day! Our product team has been growing and we've been busy working on new features. In this product update email, I cover the main features we've launched in the last few months. One thing we have learned here at Eagle is that every office and every user works differently. That's why, when we were designing our new dashboards, we built them so that you can customise your dashboard to see exactly what you're interested in. Each dashboard is made up of widgets, and each widget can be filtered to show the data you're interested in, and moved around. Every user has their own dashboard, so changes you make to your dashboard, don't affect others in your office. We invite you to check it out, go to the Dashboards tab, and click the "Edit" button to start customising your dashboard. We've added a few tools to your "Addresses" screen to give you more information about your area. Have you ever wanted to bring up someone's contact details, but can't remember their name? Try filter by date range. You can search your contact database by when a contact was created, or when you have last been in touch with them. To use it, in your contacts screen, go to the filters section, click "Other" and click "Date Created" or "Date Modified"
We've updated our Advertising payments table to make it more flexible. You can now filter and sort by more fields to be able to quickly find what you're looking for, and for extra flexibility you can export all your advertising items to CSV or PDF. We've recently added 28 new letter templates to your account, and we've added more new automations for sales, leasing, marketing and admin bringing the total to 38 in built automations. You can now send your campaigns and automatic repeating campaigns from the contact's owner - so all of your clients get personalised communications from the agent they've been dealing with. 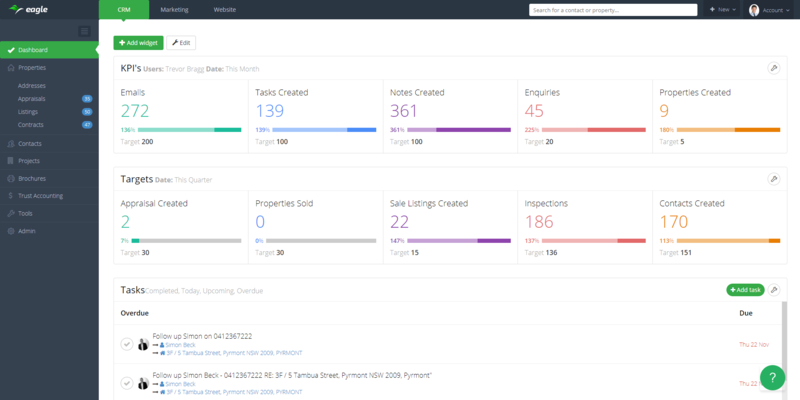 We're continually working hard to bring out more features and more value to EagleCRM and make listing, selling, leasing, marketing and admin easier, faster, more efficient and more fun. Why having social media presence is critical for your real estate business.